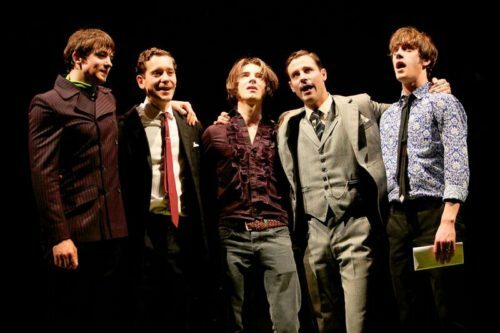 Last night was the opening night for Sunny Afternoon at the Marlowe Theatre. 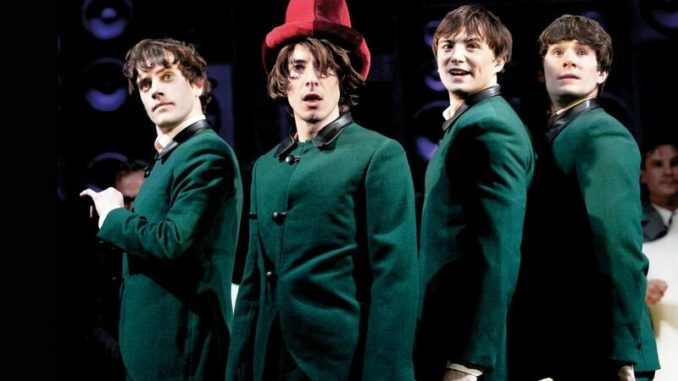 Running until this Saturday (8th April) then continuing its tour, Sunny Afternoon tells the story of one of Britain’s greatest bands, The Kinks. For those unfamiliar with the music or story surrounding the band, the four piece originated from North London and were put together by brothers Dave and Ray Davies. Initially called “The Ravens” and beginning their music repertoire with R&B and rock, they ended up changing their band name, settling on The Kinks and adding more ballads to their music catalogue. This smash hit, critically acclaimed show celebrates their music but also tells the story of the individual band members and their struggle with new found fame. Written by original front man Ray Davies, this show is perfect to honour Ray’s fellow band mates, their music and their personal stories. Ray, played by Ryan O’ Donnell and Dave, played by Mark Newnham, couldn’t be more different as brothers. Although their love of music brings them closer, it also pulls them further apart as their fame increases. Mark plays Dave with ease-the humour and character he portrays had the audience in hysterics. His battle with the fame the band brought him is poignant and there are some truly moving scenes alongside his brother. Ryan plays the front man Ray, full of ambition and confidence, but sometimes allowing his past demons to take over. Not much of a talker, Ray would rather sing his way through life, finding it easier to battle his dark thoughts and sadness over his sister’s death with music. This duo, produce some unbelievably beautiful harmonies together, often singing with the rawness of emotion you genuinely don’t expect when the show begins. Garmon Rhys plays bass guitarist Pete. His honesty is clear to see. His genuine concern and fear for his future with the band produces some truly sentimental moments, especially between him and Ray. Although Mark and Ryan are at the forefront of the vocal performances for the majority of the show, Garmon comes into his own at the end, laying himself bare and treating the audience to an unexpected melodic performance. The drummer of the band, Mick, is played by Andrew Gallo. Without the cliché band member look you’d expect, it would be easy to place Andrew at the back of the stage, forgotten about. Thankfully. Andrew came into his own and wowed the audience with an incredible drum solo, alongside some brilliant humorous dialogue throughout. The cast in its entirety isn’t on the small side. Plenty of backing singers and cast members taking on various roles, the show isn’t without its busy, fast paced moments. Somehow though, there are moments- quiet poignant moments- where the audience are sucked into stories, where the actors involved previously had you laughing but then suddenly bring you close to tears with their moving performances. Authentic props, beautiful acoustic performances, great choreography and brilliant dialogue,alongside the talented cast, make this one of the must-see shows of this year.